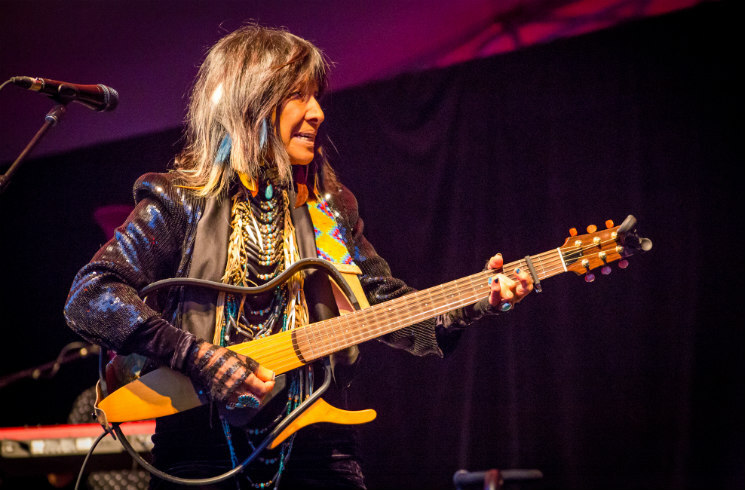 Buffy Sainte-Marie stopped her opener "It's My Way" mid-song with apologies about an uncooperative machine on Tuesday (June 28). Unfazed throngs of rain-jacketed audience members weren't going anywhere, even with the threat of rain and the technical difficulties that momentarily delayed Sainte-Marie's performance. "How do you like showbiz now?" she laughed. Perhaps the most beloved genre-defying grand dame on all of Turtle Island smiled at the crowd and strummed right back into the first track from the Polaris Prize-winning Power in the Blood, taking her time with the evening. Her four-piece band backed her newest electro hits, from "Farm in the Middle of Nowhere" to the title track of her 2015 album. Sainte-Marie then reached into her outstanding repertoire of songs that she played with a mix of gravitas and joy. She danced through "Cho Cho Fire" from 2008's Running from the Drum and serenaded the crowd over Anthony King's tremolo guitar on 1966's "Little Wheel Spin And Spin." Her voice still powerful at 75, Sainte-Marie warbled and chanted through songs she loved and ones she knew the audience would love. She even made the effort to play a jazz tune when she swept into "When I Had You," with the help of her bassist Mark Olexon. Besides a musical icon, she proved she was also still a stalwart civil rights activist, and flexed her political muscles as she sang "Bury My Heart at Wounded Knee" and "Universal Soldier." Even as the rain started to come down, her fans stuck around to soak in her performance until the end. And when she played the song that won her the 1983 Oscar for Best Original Song, "Up Where We Belong," everyone present was singing.